Since the year 2013, a familiar question in the anime community keeps bringing brought up like clockwork. You could find them whenever one of these Sequel Guides was released. Or when our seasonal collaboration of what you should be watching. 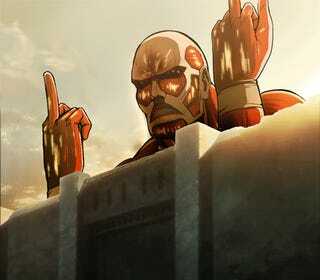 “Where is Attack on Titan Season 2?” “Attack on Titan when?” Well guess what people! Attack on Titan is finally here! Are you not entertained? Of course, there are a bunch of other sequels from popular franchises returning this season, but we had to address that Titan, I mean, elephant in the room. After 20 years of silence, beloved Berserk is returning for a sequel a few months after its long awaited return. 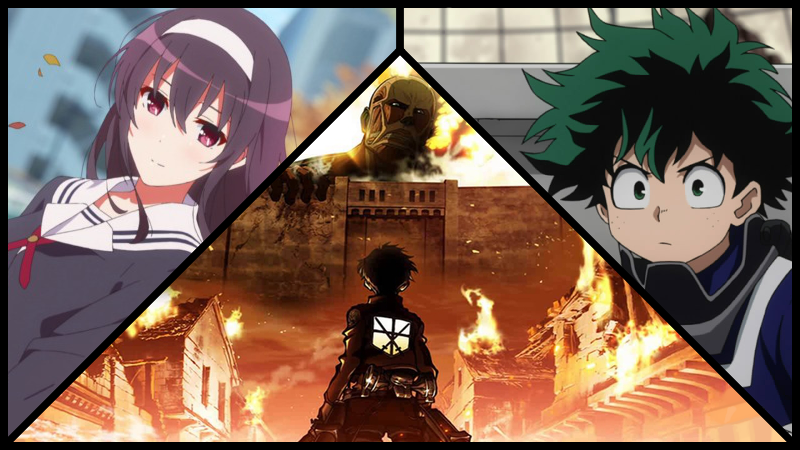 2016’s smash new action show, My Hero Academia is also coming back with a rumored tournament arc. And though Naruto recently finished its own long run, don’t be sad. Boruto is coming to fill that ninja sized hole in your heart. Allow us in the AniTAY community to be your guide into all the sequels and spinoffs returning this season and what you need to watch to be up to date. One major change though. Our usual Sequel Guide captain, Stanlick, has been busy with real life affairs so you’re stuck with me guiding this rudderless ship to harbor. And with that Stan’s baby, the Global Anticipation star rating has been replaced. Unfortunately like KFC’s secret Fried Chicken formula, I was not informed as to how to apply this Rating system so instead we’re going with two highly scientific methods to compensate: the number of MAL people signed up as “Planned to Watch” as the Global Anticipation. And our personal favorite, the Exile Anticipation Meter as created by our friend Nomadic Dec, Exile being our fearless Seasonal Collab sheepherder. The Star Rating was a tough loss that no doubt was a big loss to us all, but it is our hope that these two systems can make up for it. What the Series is About: Humanity scrapes by a thread due to an omnipresent threat of horrendous creatures known as titans seeking out and brutally killing entire cities at a time. Desperately hiding behind the largest walls they can construct, mankind is forced to fight when these behemoth slaughterers finally wise up and breach their defenses. One boy, Eren Yeager, is part of a special anti-titan combat group known as the Scout Regiment. Whilst using a special asset that both him, his friends, and superiors have discovered the boy has, what is left of the blitzed Regiment hopes to turn the tables on their longtime foes. Look to the second season of this blockbuster for high octane action and the gritty drama that accompanies all of the graphic gore and war. Estimated Exile Anticipation: He uses the gif below a lot, and hasn’t been happy with the show since around Episode 8, but I’m convinced he’ll watch it weekly in order to discuss how flawed this Muv-Luv knockoff is in an informed manner. 10/10 disappointing Kabaneri’s (he was seriously disappointed by the second half of that series. He was really enjoying it up to that point too). There are 2 Recap movies at a total of 4 hours if you can’t watch the first season. What the Series is About: Berserk, to put in short words, is the story of Guts a swordsman who uses a big sword, and his violent quest in search of Griffith, the person who previously was his boss, mentor and friend. Now, his worst enemy and his goal to destroy while at the same time, Guts is defeating both humans and supernatural beings. After saying that, Berserk is in truth a deep and complex story that centers in both beautiful and brutal things that surrounds the world and humanity, grabbing in a masterful way most aspects of the human mind. This second season, of a lackluster return, will center on what happens next now that Griffith has been reborn and Guts has recovered Casca. While the visuals and the actions scenes need more than a little work, if anything the past season did well in the music department and the spirit of the series that, while diluted in a way, encompassed and centered in most of the important parts of that part of the story, making it at the very least worth a watch. Estimated Exile Anticipation: Exile’s read Berserk, but he likes impressive Sanzigen CG animation. This is not Sanzigen by a long shot, but the story’s great, so 5/10 poor camera angles. What the Series is About: Boruto is the child of Naruto Uzumaki, the Seventh Hokage. While Naruto had many adventures Boruto is only coming into his own. He has yet to truly make his mark on the ninja world, still living in the shadow of his father. Can he surpass him? Only viewers can tell. Estimated Exile Anticipation: Naruto was not his jam, because he would have brought it up at some point. Boruto probably even less so. On the other hand, he’d definitely encourage you to play Dra+Koi, which is unrelated, but I have on good authority is an excellent VN. 1/9 number of fox tails that foxes actually have. What the Series is About: The Eccentric Family follows a family of tanukis, gifted with the shape-shifting powers ascribed to them by Japanese folklore, as they navigate life and negotiate the tenuous balance that exists between them, the flying tengu, and humans in modern Kyoto, with sometimes hilarious, oftentimes bittersweet and poignant results. The wide existential scope is examined primarily through Yasaburou, a tanuki, and Benten, a magical human, and their unconventional relationships with their tengu mentor, Akadama. In this second season, their lives are thrown into further disarray with the return of Akadama’s estranged son, whose sudden appearance after a hundred years sends ripples through tanuki and tengu society, with steep ramifications. As the second adaptation of the book series by Tomihiko Morimi, also author of The Tatami Galaxy, the distinctive and unconventional style, both in content and animation, promises to make this second season just as memorable as the first. What the Series is About: Yui has always dreamed of becoming an idol, even if becoming one is almost impossible for her. But one day, an idol theme park opens next door with the special announcement that a very special idol, Laala, will be coming as well! Ecstatic to hear the news, Yui’s dream of becoming the cutest and most popular idol in the whole world only gets bigger and bigger! Estimated Exile Anticipation: He likes certain idol shows, especially battle idol shows like AKB0048 (which is worth seeing by the by), but prefers the more mecha heavy series of Macross, so I’m guessing PriPara is absolutely something he’d definitely be up to date on. 8/10 arcade game-based anime. What the Series is About: While the original DanMachi series was a harem romcom that happened to be set in a fantasy city, this is more of a hard fantasy epic. It’s a side story/spinoff focused on Ais Wallenstein of the Loki Familia, a powerful adventuress in one of the foremost dungeon-conquering parties in the city. While they do cover the intersection points of the two tales from Ais’ perspective, this covers a lot of completely different territory. Where Bell’s story mostly dealt with his personal acquaintances and an odd mix of lucky and unlucky encounters, Ais’ story is a bit broader in perspective; while her crew is quirky in its own ways, Sword Oratorio covers multiple Familias and their circumstances, city- and dungeon-wide conspiracies, and massive multi-party battlefronts. The opponents are much more powerful and insidious, the stakes are far higher, and the most annoying characters from the original series have way less screentime. Estimated Exile Anticipation: I know he’s looking forward to this one, because DanMachi’s world would be more interesting without Bell, so 9/10 teeth brushed. What the Series is About: In a world where the majority of people are born with special abilities (Known as Quirks), our protagonist Izuku Midoriya is born without one. However, this does not stop him from trying to achieve his dream of becoming a hero and attending U.A. High School. After a fateful encounter with the great hero All Might and inheriting his quirk, he is able to start working towards his dream. With the first season containing Midoriya and his classmates training and the introduction to the series’ villains, the new season will tackle a staple of shounen anime: The tournament arc! What the Series is About: Takashi Natsume has always been a little bit different from other boys and girls his age, since he can see Youkai all around him every day. And sometimes they chase after him! But one day, the now 15-year old boy comes across a mysterious book of sorts, called the “Book of Friends”. It turns out that his grandmother also was able to see Youkai, and put the names of every Youkai she came to control into the “Book of Friends”. Now that it is in his possession, Natsume also can control the Youkai named in the book. Aided by the cat-like spirit and mentor, the aptly named Nyanko-sensei, Natsume sets out to release the spirits from his grandmother’s control. But while some spirits are friendlier sorts, not all are! Estimated Exile Anticipation: The perennial “I’ve heard it’s good, but haven’t seen it” show of AniTAY, I’m pretty sure Exile’s not up to date to anticipate the sixth season. 0/10 spirits contracts dissolved. What the Series is About: Shingeki no Bahaumt: Genesis (aka Rage of Bahamut: Genesis) surprised most jaded anime observers when it came out, as we all didn’t expect much from an adaptation of an mobile phone card game. It proved itself to be an absolute classic, with great animation, fabulous world-building and some great characters, including excellent-example-of-the-form “loveable rogue”, Favaro, the man with the stellar ‘fro, and his uptight opposite number, everlasting frenemy Kaisar. Shingeki no Bahamut: Virgin Soul, once again brought to us by MAPPA, picks up 10 years after the end of the previous series. That narrative was pretty well wrapped up, so the sequel has a new Main Character, a spirited looking girl named Nina, who goes to the capital as a bounty hunter in a world changed much in the decade since we last saw it. There’s new characters afoot, but fear not, old favorites Favaro and Kaisar and others will be joining the cast. Obviously, Virgin Soul has expectations to live up to that its predecessor did not, but if MAPPA can maintain the great animation and sense of discovery and adventure from Genesis, then we could have a real winner on our hands. FARVAROOOOOOOO! What the Series is About: Ghosts and spirits are real, but most of them are either harmless or friendly, and are merely meandering about as they take their time to pass on. However, there are some spirits that feel the need to bother those who still have life. Luckily, shinigami are around to combat these hostile apparitions and make a fair living doing so. This story centres around one particular shinigami who is crippled by debt, and his newest friend who has the ability to see the supernatural. What the Series is About: Saekano is about a Visual Novel Junkie in his quest to create the best Visual Novel ever, with harem doujin circle on his side, and best normie girl Megumi Kato as the main heroine! If you didn’t get any of these words, Saekano is probably not a show for you: this show lives and dies on meta humor, with funny jokes, great character interactions, amusing rom com antics and more to create a very entertaining package. It’s better than it sounds, with the first season as one of my favorites from the year it aired, but it’s definitely for a specific audience, so give it a shot if any of this sounded like your cup of tea. What the Series is About: Ayanagi Academy is a school that is focused on music, and within the musical department itself are a group of five boys struggling to keep up. Their goal? To make the Star Frame Class, which is taught by the Kao Council, who are the best and most talented students who sit atop the hierarchy of the entire academy. In the cutthroat world of male idols, will our heroes fulfill their dreams and become stars themselves? Estimated Exile Anticipation: Extremely doubtful that he’ll watch this. 9/10 titles too close to Pokémon species for avoiding confusion. Estimated Exile Anticipation: Pretty sure this is favourite anime of all ti—no, wait, no it’s not. 1/10 pet seals (god, I hope the other pet seals are okay). Special thanks to everyone that helped out. Your names are up there.